“A new type of volunteer opportunity is coming to the Fox Cities this spring in the form of the Give Back Bus. 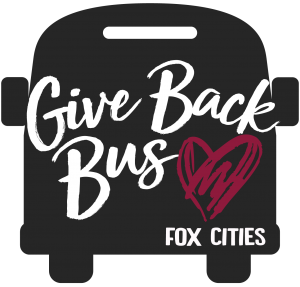 For a small donation, the Give Back Bus will transport riders on altruistic adventures around the Fox Cities area. But there’s a twist – destinations will not be revealed until the bus arrives at its final stop. Trips are generally four hours long and there is no limit to the scope of projects planned. Volunteers could help clean up a local park, serve meals at a shelter or build a house for a family in need. This initiative was pioneered by members of 2017 Leadership Fox Cities, a community-based professional development program which is part of the Fox Cities Chamber of Commerce, in partnership with The Volunteer Center in Appleton. The Give Back Bus experience will inspire passengers to do good again – at work, at home and in their community,” says Kristin Cates, marketing director for The Volunteer Center. The Give Back Bus is modeled after similar programs, the closest of which is located in Washington County. Its goals are to bring excitement to volunteering while connecting people and organizations, as well as promote civic engagement and build community pride by focusing on education and urgent, sometimes invisible, needs in the community. I was given the opportunity to join the April 14th bus after a few people cancelled. However, that was the weekend of an April blizzard and I note on the web page that the first ride of this extraordinary idea didn’t leave the garage. I’m on an email list for future dates and hope to find out first-hand where the bus will take its passengers and how we can give back to the Fox Cities community. The “We are the World” Blogfest is in its second year of a heartfelt journey. This blogfest’s goal is to spread the message of light, hope and love in today’s world. We are challenging all participants to share the positive side of humanity. This month’s co-hosts, Dan Antion, Mary Giese, Michelle Wallace, Simon Falk and Shilpa Garg, welcome participants and encourage all to join in during future months. #WATWB is a blog hop on the last Friday of every month. Click HERE to check out the intention and rules of the blogfest and feel free to sign up at any time. You are always welcome! It sounds like a unique idea. The only glitch I can see is volunteers who may not be up for or suited to the designated task once they arrive. I hope you get called again Mary. I look forward to hearing about your adventure. I hope I get booked on the second planned bus trip. I think it might be quite the adventure. I’m looking forward to hearing about your ride. It sounds like a interesting program. Ha ha – I think you could make a good contribution to almost any project. I think that’s a wonderful idea! I’ll have to come up to Appleton to catch a ride! This sounds like fun! I can’t wait to read about your experience, Mary. There will definitely be a post if I make it on the bus. I’m very curious about the volunteer opportunities the bus will take people to on these rides. That sounds like such an adventure! What a unique and helpful idea. It’s very unique and an idea that could spread to other communities. I really love the forward and creative thinkers in the Fox Cities. What a cool idea! I hope it becomes very popular and spreads to many more communities! Oh absolutely. Spreading the love of people on a bus has to be rewarding for the riders, but oh so helpful to the people receiving the love. You’re welcome, Dan. No Facilities is on my list, so that means I have 12 to go after work today. Enjoy your duties and the many wonderful posts that you’ll read through the weekend. I am going to try to read as many as I can over the weekend. I do enjoy these posts. It’s too bad your first attempt was cancelled by bad weather. I hope you get on the next one – or at least one soon. Like Dweezer, I had the same initial thought … not knowing what the activity will be could leave participants improperly prepared. Good luck, Mary. This has all the makings of an interesting experience! I am guessing that those in charge have already taken into account the activity vs. abilities. I’m sure it will be fine. I was thinking more along the lines of needing rubber boots to tromp around an outdoor area doing cleanup vs working indoors. What an innovative idea. It sounds like fun to be involved in a do-good adventure, and I look forward to hearing when you get a chance to participate. I would guess the second bus will be scheduled after May and I hope I’m available for whatever date that may be. I also look forward to the follow up Mary … it’s a great idea! People like to have a common purpose. Great post thank you! It will also lead to new connections/friendships amongst the participants! I love the idea of a Give Back Bus. I’m looking forward to hearing how it went when you do finally get a go at it. I’ll be sure to report back. Thanks for your comments! I’m looking forward to serving my community! What an exciting project, encouraging people to get involved at a “grassroots’ level in their own communities. You’re welcome. I’m waiting to hear when the next bus will be heading out so I can sign up. I think it will be a positive and rewarding day.